ThermalTake reveals the V3 BlacX Edition, a new budget mid-tower steel case with a top-mounted HDD docking station, USB 3.0 support, an all-black paint job, and one included 120mm blue LED fan. The dock appears to be the main difference compared to the two year old V3 Black Edition. Thermaltake, being the industry pioneer brand in thermal solutions, carrying the corporate vision of “building Thermaltake Technology into a cultural brand for the enjoyment of entertainment, e-Sports, technology, and lifestyle” and continues to drive toward the corporate mission of “delivering the perfect user experience” on all segment of the market. The newest member of the Thermaltake V series family – the aesthetic V3 BlacX Edition chassis is an evolution of V3 Black Edition Chassis with the BlacX docking station which offers advocates who desire an incredible value with an extra touch. The new V3 BlacX Edition chassis is designed with the goal of offering more to the advocates who have excessive data to manage and required more than a stand chassis for daily usage but still keeping it within the means. With that initiative in mind, we used the V3 Black Edition chassis by adding our BlacX docking station to accomplish the goal. The BlacX docking station enhanced the original V3 Black Edition chassis data management ability and kept all the great functionality of the V3 Black Edition chassis. 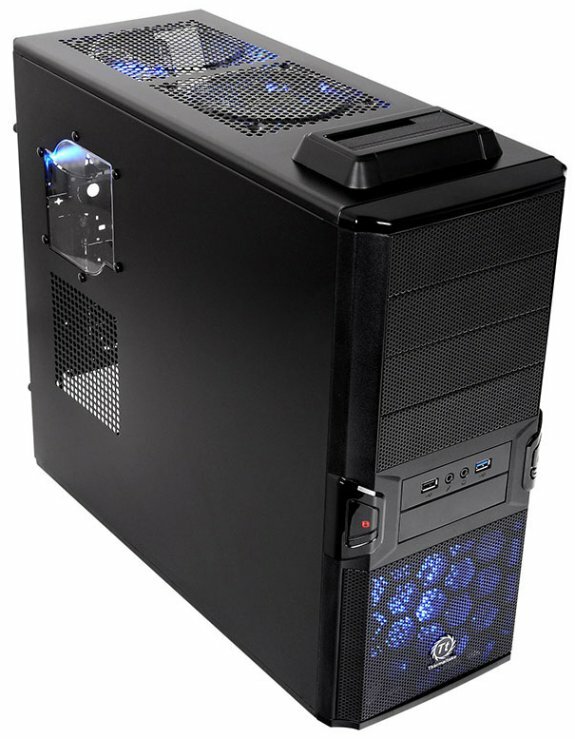 The new V3 BlacX Edition chassis is a mid-tower that will accommodates all ATX or ITX motherboards, three 5.25” and one 3.5” bays accessible from the front, and further four 3.5” and one 2.5” bays are accessible from the inside built with a modern all black interior and exterior design. The external Superspeed USB 3.0 and the top-mounted HDD docking station, provide a trouble-free environment and convenience data management for the advocates. Moreover, the bottom based PSU mount and metal mesh front bezel with dust filter, plus the option for 3 additional case fans: the front panel allows to add a 120 mm intake fan, the top panel offers the possibility to install a 120 mm exhaust fan and on the bottom is room for yet one more intake fan to optimize ventilation. The V3 BlacX Edition mid-tower chassis will be an all-rounder with an incredible value for advocates who desire more than an ordinary chassis.